Whether you’re a crunchy granola mom, a helicopter parent, or practice free-range parenting, the Magic Bullet Baby Bullet is something you’ll probably find yourself trying out at some point in the baby food process. Don’t get me wrong – I am totally in the camp of discovering these big parenting projects or ideas and embarking on them, only to realize how much time and effort is involved and allowing them to slowly fizzle out. As a parent, I get that so much. But if you understand the benefits of making your own baby food and actually knowing what’s going into your kid’s food, the time and effort you spend is well worth it. And honestly, the Magic Baby Bullet might be exactly what you need to help you along the way. Some might argue that you can also make baby food with any other blenders that work the same, and in some ways, that’s legitimately true. And when I tried out the Magic Baby Bullet myself, there were both good and bad aspects of dedicating your baby food ventures to the Magic Baby Bulletalone. Makes Baby Food In Five Minutes: The Magic Baby Bullet claims to not only make healthier and fresher baby food, but also enable you to blend and create your homemade baby foods in five minutes. That might be a little bit exaggerated since several jars of baby food is going to take longer than five minutes, but they’re not wrong in that the Baby Bullet does help make baby food quicker in general. Stores Individual Containers Of Baby Food: The Magic Baby Bullet System comes with a set of six individual baby food jars with lids that have dials to put in an expiration date. The jars also come on a tray that they fit into snuggly, enabling you to be able to store the tray in your refrigerator until that cycle of baby food is finished. 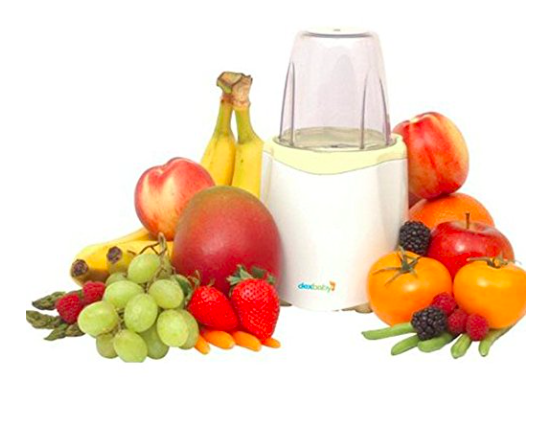 Makes Different Types Of Baby Food: With the blend blade, you can chop and puree different fruits and vegetables, and with the milling blade, you’re able to mill harder foods like raise or oats and make different oatmeals or baby-safe rice pudding types of baby food. Adheres To Different Baby Food Stages: According to the Magic Baby Bullet website, the Bullet has the ability to make different types of baby food at each stage. For stage one, with the initial introduction of pureed foods, the Baby Bullet can provide the tools to create simple mixed vegetable and fruit dishes. When your baby is ready for stage two, you can then add more complex flavors to each other in the Bullet, and for stage three, you can just pulse food until it’s still chunky but not too large for your little one. Gives You Baby Food Faster And Cheaper: The Magic Baby Bullet also claims to make it possible for you to make baby food “10 times faster, 10 times cheaper, and 10 times healthier” than the baby food you would typically buy at the store. For some, it might take a little longer than others to get the hang of making your own baby food, but it’s definitely one of those things that you can get better at if you actually stick with it. It Can Be Time Consuming: I like to feed my baby healthy food just as much as the next mom, but honestly, even with something like the Magic Baby Bullet, making your own baby food can get time-consuming. That doesn’t necessarily mean there’s anything wrong with the Bullet itself, but maybe more so with dealing with the whole act of making baby food in general. It Takes A While To Get The Right Consistency: The first time I tried to make baby food, I ended up with what was essentially orange juice in each of the little baby food jars. It took a bit of trial and error to get the proper consistency, but it’s not super easy. There Is Still A Struggle To Get The Right Flavors: Just because you have the recipes and tools to make baby food yourself, it doesn’t necessarily mean that your baby is going to magically love all foods now. No, they will still turn up their tiny noses at new tastes, making you have to work at finding the right flavors. It Might Become Less Useful After A Few Months: While the Magic Baby Bullet says that it enables you to make baby food for each food stage of your baby, we all know that sooner rather than later, your baby will want to start eating little chunks of diced up foods. And when that happens, all of those jars of baby food you prepared might not be as welcome as before. But It Gives You Peace Of Mind: Still, at the very least, being able to make your own baby food gives you the immediate knowledge of what’s going into what your baby is eating. Instead of lots of sugars and ingredients that you can’t even pronounce, you can feel more secure with the spinach and fresh fruits you blend together. And It Helps Make Realistic Baby Food Serving Sizes: With a typical blender, you might be left with a huge pitcher full of baby food that your little one might not even eat. With the Magic Baby Bullet, you can make smaller portions of different things to give your baby a variety and not waste anything on your part. Here are some good alternatives to try. At $24, the Dex Baby food processor is admittedly less expensive than the Magic Baby Bullet, but it also lacks the individual baby food jars or silicone popsicle tray. It does, however, let you store the pureed baby food in the same plastic container you attach to the food processor, and since it’s a small size, you won’t necessarily be wasting much if your baby doesn’t finish it all. With this one, you can also steam the baby food before you chop or puree it, which is a huge bonus, but again, it lacks all of the baby food making extras that the Magic Baby Bullet comes with. You can obviously put it in individual storage containers yourself, but having a whole system with the Magic Baby Bullet might sometimes be more useful for some. The Baby Brezza is basically just a smaller food processor that is simple to use but plenty useful with its many settings that enable you to make baby food of different textures. You can find it on Amazon for $62, which is more expensive than the Magic Baby Bullet, but like many other baby food makers, it also steams the food before you puree it. I wouldn’t say that I’m a fair-weather DIY mom, but I know my limits and when it comes to making my own baby food, I’m never going to be a super mom. However, with the Baby Bullet and all that it does to help you make baby food, it’s hard not to jump on the organic, homemade baby food train. For a little while, at least. With all that the Baby Bullet offers, including the recipe book and baby food jars and silicone popsicle tray, you really can’t beat the deal. Even if it’s something that you end up using for just a few months, the peace of mind that you get from making your baby’s food totally from scratch is almost priceless. And depending on how much you’ve spent on jarred baby food, you’ll also save in the long run by purchasing your own fruits and vegetables to puree baby food with the Baby Bullet, free from any preservatives or chemicals. Regardless of what kind of parent you are, the prospect of making your own baby food will likely come up at some point during those months before your baby isn’t so much of a baby anymore. And if you decide to go through with the baby food making adventure, then the Baby Bullet is going to be your best bet to get the job done. But please, from one overworked parent to another, do not stress out over your baby food making skills sucking the first few times around. If nothing else, you’ll have some smoothie mix-ins for yourself before you get it right. So basically, it’s a win-win situation all around.